I’ve designed many bedrooms for teens, young adults, and adults; but the moment I was asked to design a baby’s nursery I realized that I have never done one before! Designing this nursery had me thinking about why more people aren’t requesting for interior design for nursery. Why aren’t more people interested in converting their rooms into baby nurseries? I’ve been in the interior design industry since 2006. Not as a professional but as a student/intern/design assistant before my time as a professional interior designer. 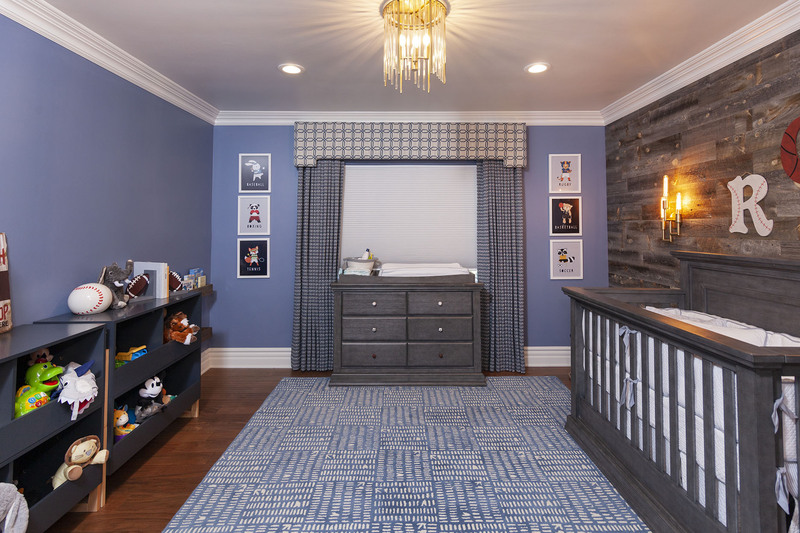 During the past decade, guess how many baby nursery design projects I’ve come across?… One! And that was recently. A colleague of mine was designing a baby girl nursery while I was designing a baby boy nursery. That was her very first baby nursery interior design project as well. I realized that even during my design assistant days I never heard of baby nursery interior design ideas, not even for the wealthiest of clients. I get it, you may be thinking not many people have the luxury to dedicate a room for a baby that probably won’t even sleep in its fabulous new crib for at least 6 months of being born. However, that baby will grow up and will eventually need a bedroom to sleep in… why not start early? Nursery decor doesn’t necessarily need to be decked out in a crazy theme. A well-designed baby nursery will grow with the baby. 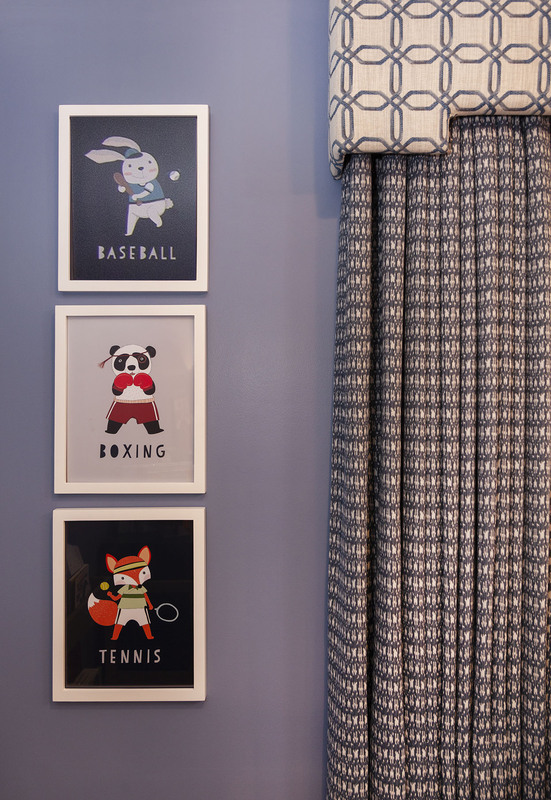 Sure, at the beginning stages of planning out your nursery you may want to choose a theme… for example the nursery I designed was animal sports theme. Pretty specific isn’t! Both parents were very involved in selecting the theme. 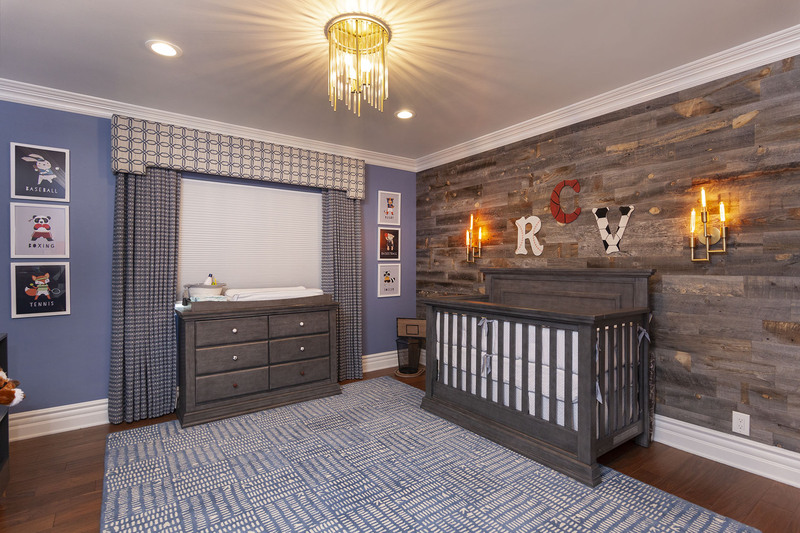 After listening to their design requests, one very specific one was made… “We don’t want the nursery to look very kidd-ish” That’s probably why most people refrain from dedicating a room or guest room as a nursery. 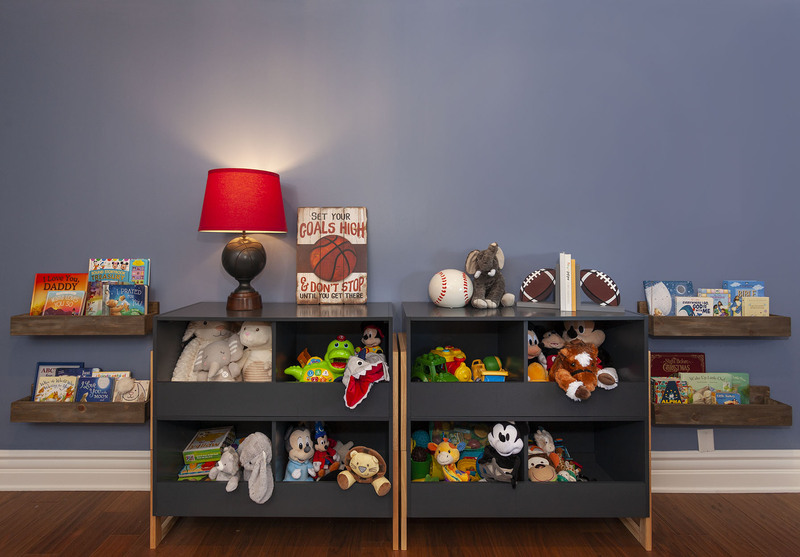 Parents in general may be dreading the thought of the converting cost to re-design of their nursery back to a more “grown up” room within a short period of time. 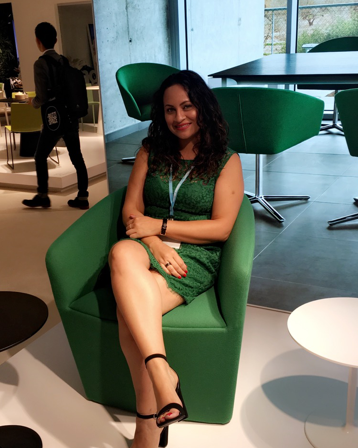 In this nursery interior design blog post I will discuss my experience on researching and executing for interior design ideas for nursery. Sports and animals weren’t really vibing with me. Honestly all I could really think about is how am I going to pull off animals playing sports without it looking kidd-ish? 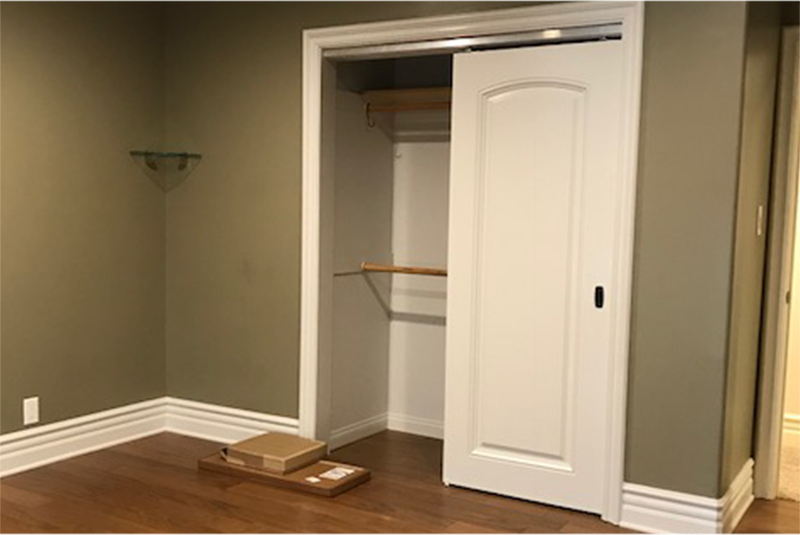 After spinning countless decorating ideas, I finally realized that this is just like any other project; I took a different perspective on it and started to focus on the big-ticket items like selecting wall colors, flooring, drapery, light fixtures, an area rug, and furniture pieces. I took my client’s words literally; I ditched the pastel colored wall murals and focused on bold colors and patterns instead. I would revisit the animals playing basketball idea later. 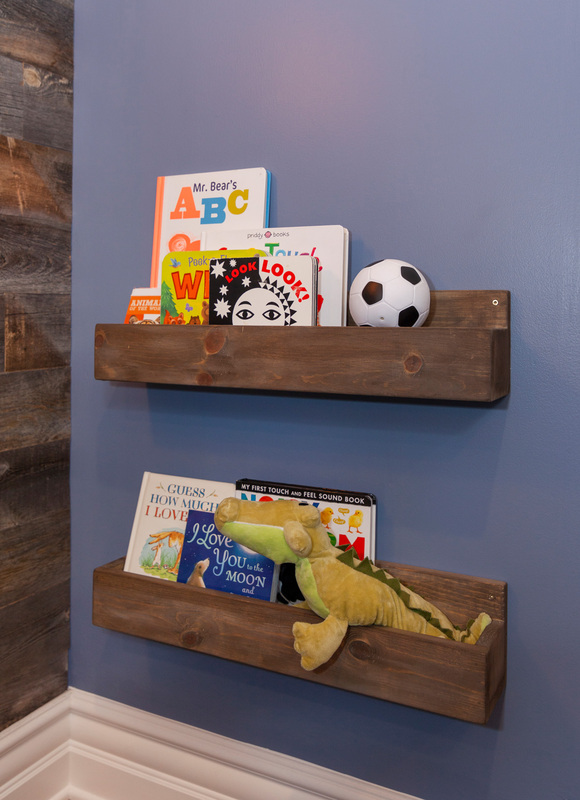 I knew I can incorporate them within my design concept through wall art, accessories, toys, and books. “Let the room grow with the baby” was my focus for this project. I selected a bold blue for the wall paint color (Bracing Blue from Sherwin Williams) along with an accent wall of Stikwood’s reclaimed wood stickies. (I know most of us designers are over accent walls, but this was an exception!) 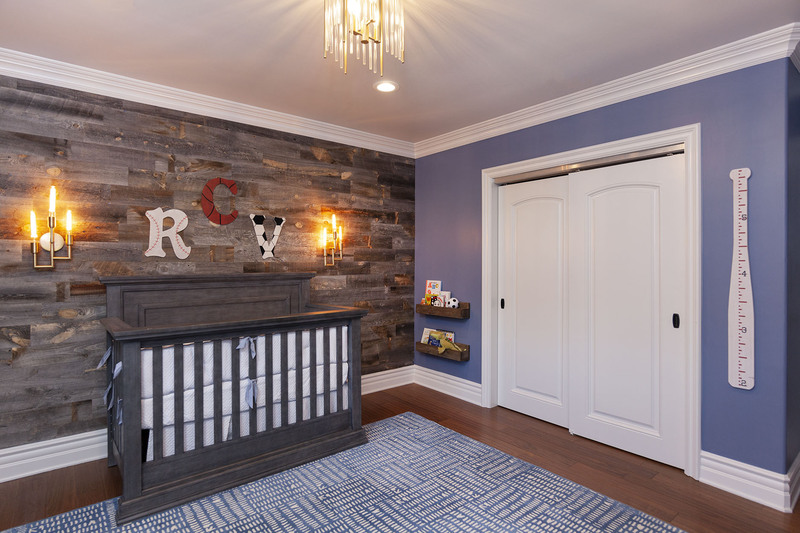 I also added other wooden accents to tie in the accent wall, by sourcing customized wooden shelves for books and wooden letters for the baby’s initials above the crib. Bold wall colors call out for bold custom drapery; a pattern on pattern design. The bold textiles inspired me to choose brass scones and a chandelier for a touch of elegance. The brass chandelier I found reminded me of a trophy, perfect for the future sports champion! I created a space the sports playing animals were the star of the show for now! This nursery is now ready to see this sweet little boy grow up. Simply adding a bed, nightstands and a desk for his homework will help transition him into his teen years until he goes off to college. Thereafter this room is cool enough to be Dad’s future den! If you are still deciding if a baby nursery is the right option for you, I hope this post has encouraged you to do so. The way I see it, children need a place where they feel safe surrounded with their favorite books, toys, and blankies. Empowering them where they have a place to play and learn while stimulating their creativity at an early age. I was honored to have been a part of my client’s new baby journey. They have been working with me and my design group for several years now; working on various projects. This nursery interiors project brought me much joy as I know how much this really meant to this loving couple. They have prayed for this child for years. It was very heartwarming to see their facial expressions as I presented them my baby nursery ideas. Their reactions were filled with joy, gratitude, and excitement; knowing that their baby nursery was about to come to life along with their sweet baby boy soon. Stories like these make my job as an interior designer much more satisfying and humbling. STUDIO 9 looks forward to be a part of your family’s memories! 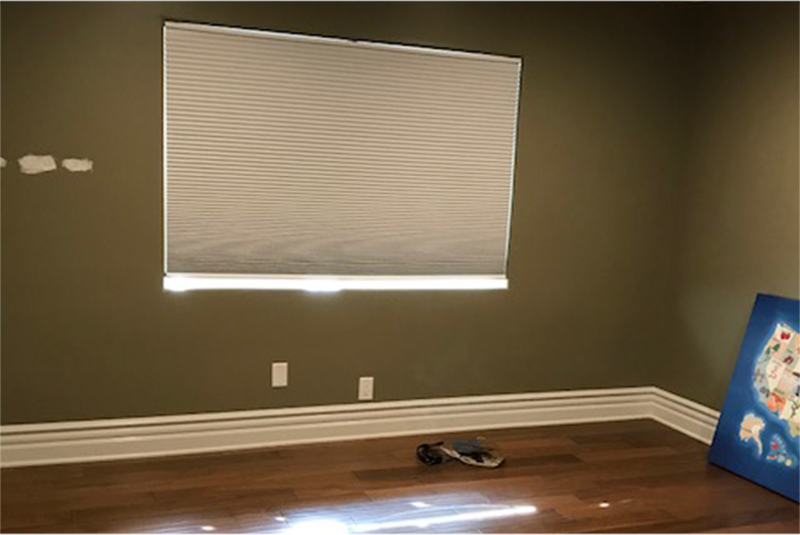 Simply contact us for a complimentary consultation, and we will take care of the rest.